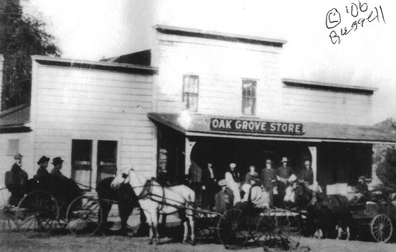 Prior to the 1920’s, this was an active hotel. Over the years, it has served many other uses and still exists in 2014. 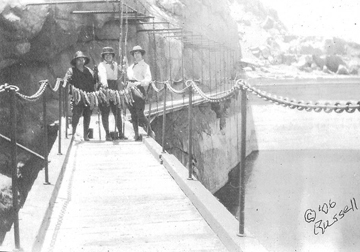 Cat-walk to the dam at Lake Moreno, 1921. This lake was filled by Hatfield (“The Rainmaker”) in 1914. It is still a part of San Diego City’s domestic water supply and is located in the Campo area of eastern San Diego County. The cat-walk system no longer exists. Left to right are Mrs. Phillip Hamble, Cora Russell and Mrs. Earl Hambell with their string of black bass. Additional cat-walk photos are available through the history committee. 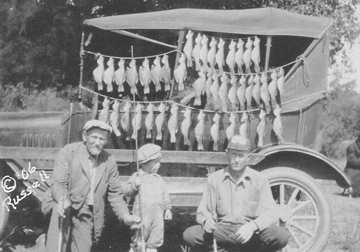 The Black Bass Catch at Lake Moreno, 1923. Left to right are: Mr. Heckler, Don Russell, Lewis F. Russell. Pictures of other catches are available. Railroad trestle on SD&AERR over highway 94 in eastern San Diego County, 1918. Still in use by Railroad Museum. This dam is in north eastern San Diego County. 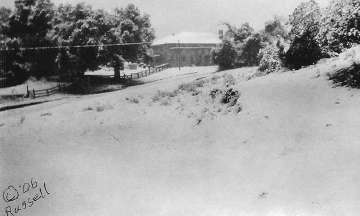 The dam still exists and is owned and operated by Helix Water District. 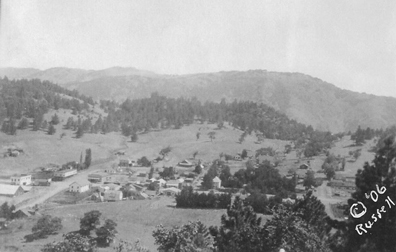 Town of Julian, August, 1916. 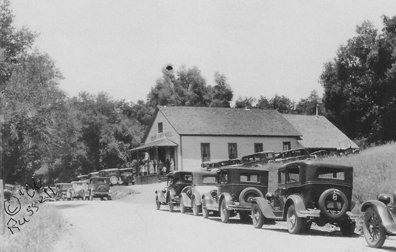 Several buildings in this photograph still exist and are in service. Mabel Garbani’s wedding. The hall is still in service and managed by a volunteer organization. The Garbani family goes way back in local mountain history, and some family members still live in the area. The hall is available for rentals, weddings and other events. 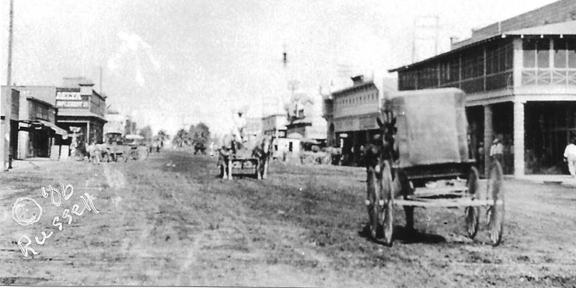 Main Street, Brawley, Ca., 1908. Streets are somewhat changed but still run in the same directions. Noble Mine, November 12, 1917. 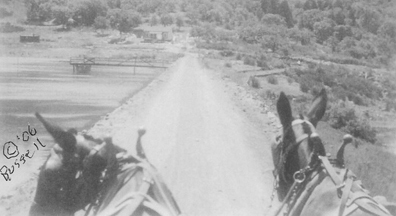 Mrs. L. F. Russell is ‘up’ (colloquial: driving) the wagon. 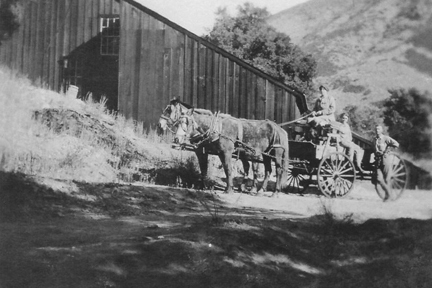 The mine was located in Pine Creek, north of present day Pine Valley. It was a producing gold mine. The actual location is now lost. Taken by an unknown photographer during the 1890’s. Later it will become Perkins store. At the time of the picture, it could have been operated by Warren Gorton. It is a fact that he had the store at one time. Perkins is in the same location and operates today.